This product has been meticulously developed to meet and exceed customers demands. This products are recognized worldwide for their superior performance and reliability. Protein lanolin shampoo is made with natural ingredients for maximum safety and the best results. It is a coconut oil-based shampoo cleans thoroughly without stripping the natural oils from a pet's coat, highlights all coat colors and leaves a soft sheen. It is safe for dogs, cats, puppies, and kittens over 12 weeks of age. 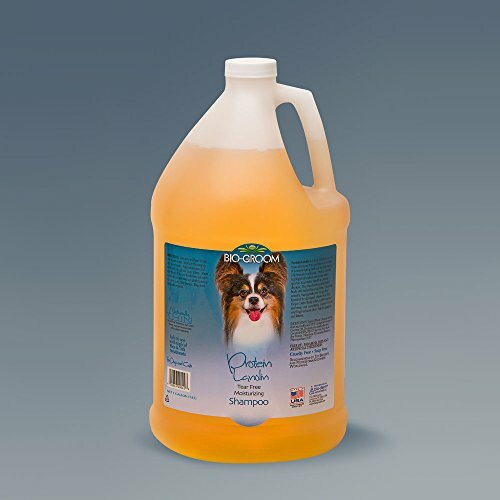 Protein lanolin conditioning pet shampoo is biodegradable. Dilutes 4:1. Available in 1-gallon size. Directions for use: shake well before using. Wet pet's coat completely with warm water. Dispense a generous amount of shampoo into palm of hand and thoroughly massage into pet's coat beginning at head and working back towards the tail. Avoid getting into eyes. Rinse completely. Repeat as necessary. Direction for use - shake well before using. Wet pet's coat completely with warm water. Dispense a generous amount of shampoo into palm of hand and thoroughly massage into pet's coat beginning at head and working back towards the tail. Avoid getting into eyes. Rinse completely. Repeat as necessary. Measures 12-inch length by 6-inch higth by 6-inch width.